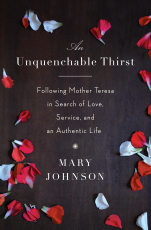 At seventeen, Mary Johnson saw Mother Teresa's face on the cover of Time and experienced her calling. Eighteen months later, she entered a convent in the South Bronx to begin her religious training. Not without difficulty, this bright, independent-minded Texas teenager eventually adapted to the sisters' austere life of poverty and devotion, and in time became close to Mother Teresa herself. Still, beneath the white and blue sari beat the heart of an ordinary young woman facing the struggles we all share -- the desire for love and connection, meaning and identity. During her twenty years with the Missionaries of Charity, Sister Donata, as she was known, grappled with her faith, her sexuality, the politics of the order, and her complicated relationship with Mother Teresa. Eventually, she left the church to find her own path -- one that led to love and herself. Provocative, profound, and emotionally charged, An Unquenchable Thirst presents a rare, privileged view of Mother Teresa. At the same time, it is a unique and magnificent memoir of self-discovery.